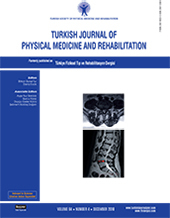 4 Department of Physical Medicine and Rehabilitation, Tatvan State Hospital, Bitlis, Turkey DOI : 10.5606/tftrd.2018.2422 Objectives: This study aims to assess the effects of isokinetic quadriceps and hamstring strengthening exercises on balance, proprioception, and physical function in patients with moderate-to-severe knee osteoarthritis and moderate fall risk. Patients and methods: Between November 2011 and December 2012, a total of 39 participants (30 females, 9 males; mean age 61.7±8.6 years; range, 18 to 79 years) with Grade 2 or 3 knee osteoarthritis according to the Kellgren-Lawrence radiographic grading system and moderate risk of fall with active knee pain were included in this study. All participants received isokinetic quadriceps and hamstring strengthening exercises for six weeks. Pre-treatment quadriceps and hamstring muscle strength (peak torque and total work value) and quadriceps to hamstring muscle strength ratio at angular velocities of 60°/sec and 180°/sec, range of motion (ROM), average proprioceptive errors at 15-45° and 30-60°, the Berg Balance Scale (BBS) scores, the Western Ontario and McMaster Universities Osteoarthritis Index (WOMAC) subscale scores, the Visual Analog Scale (VAS) scores, and physical function tests results were compared with the post-treatment results. The correlations of pre- and post-treatment BBS and average proprioceptive error at 15-45° and 30-60° changes to other pre- and post-treatment clinical measurements changes were calculated. Results: Post-treatment quadriceps and hamstring muscle strength at angular velocities of 60°/sec and 180°/sec and quadriceps to hamstring muscle strength ratios at angular velocity of 60°/sec, ROM, average proprioceptive errors at 15-45° and 30-60°, BBS scores, WOMAC subscale scores, VAS scores, and physical function tests significantly improved compared to the pre-treatment results (p<0.001). Statistically significant correlations were found between the pre- and post-treatment BBS score changes and pre- and post-treatment VAS (p=0.015), WOMAC-Pain (p=0.017), WOMAC-Physical Function (p=0.005) scores and Timed Up and Go Test (p=0.036) scores.